Mount Sugarloaf is a 412-metre mountain in West Wallsend in Lake Macquarie. It’s only 40 minutes from Newcastle or 25 minutes from Speers Point in Lake Macquarie, but it feels remote. 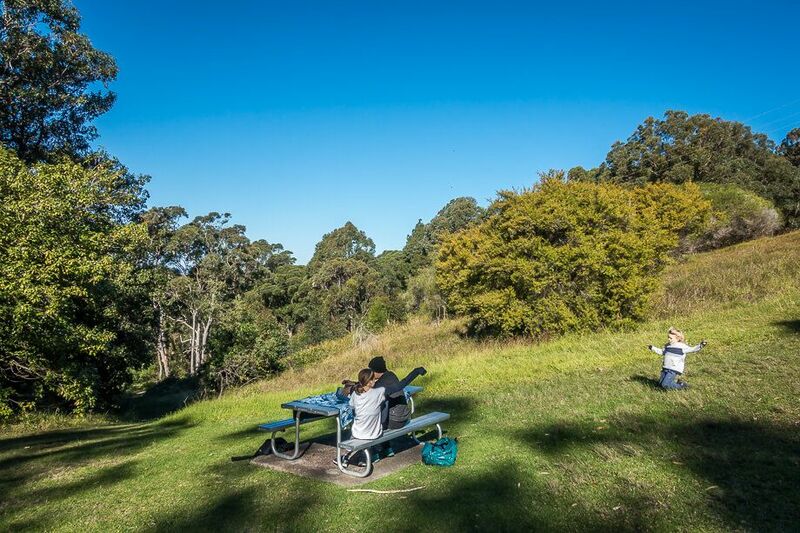 You can have a picnic and walk to the summit. It’s a very short walk from the carpark. There’s a nice view to the east. The forest stretches as far as the eyes can see, and you can see Lake Macquarie in the distance. Although the view from the top of is lovely, it’s not as fabulous as I expected. I expected a 360-degree view, but in reality, the view is partially hidden by trees. And the broadcast transmission towers are unsightly. 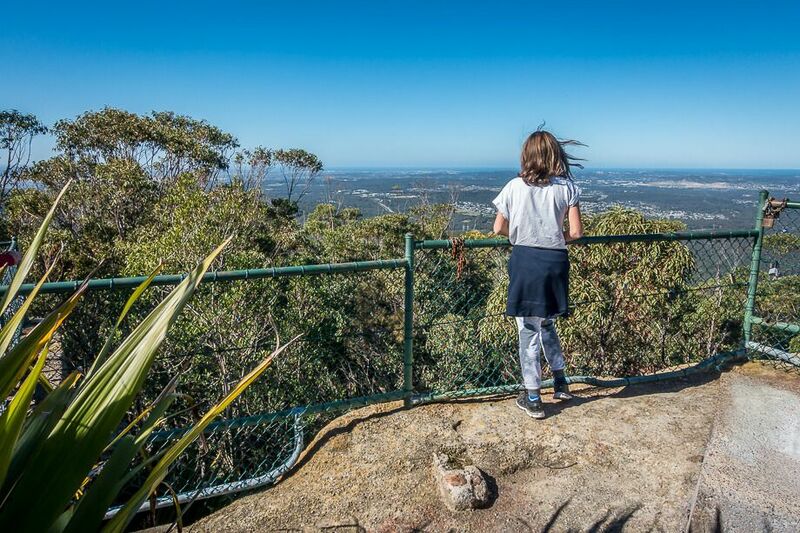 Still, Mount Sugarloaf is a nice place to go near Newcastle or Lake Macquarie for a picnic with a view and a walk to the top of the mountain. You can see many other families on the weekends doing exactly that. There are several picnic tables along the road and toilets near the carpark. The walk to the summit is only about 500 metres from the carpark. The walk is easy… it’s steep, but it’s short and there are steps. 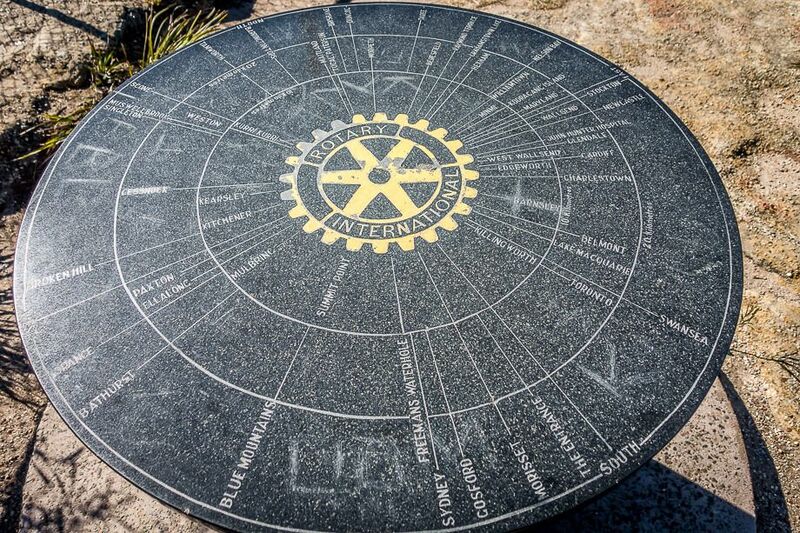 At the summit, there’s a round stone table that shows where places are located, like Blue Mountains and Bathurst. And there are views out to Lake Macquarie and surrounding areas. The lookout is fenced. 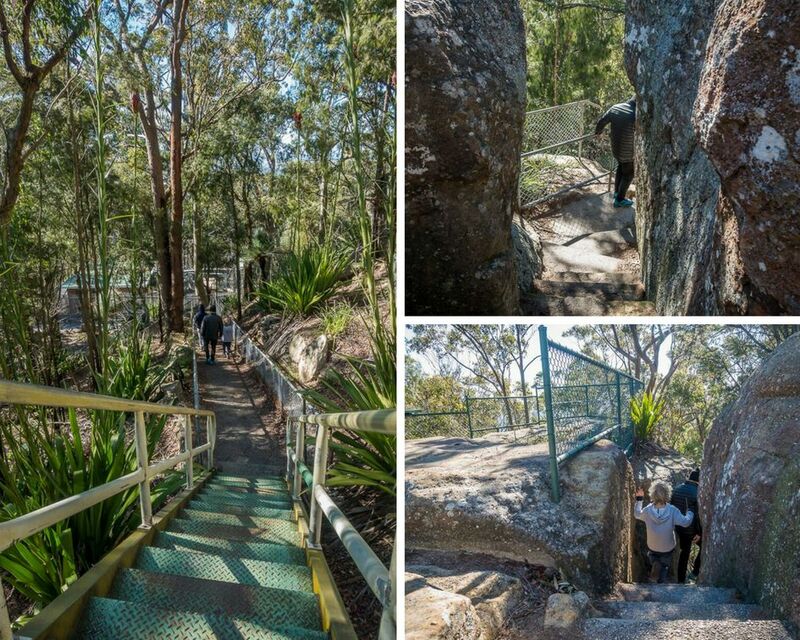 There are other bush walks around the mountain as well. The walks are badly indicated, so click on the links below if you’d like detailed information. Or check out the map at the bottom of this page. These walks start from the carpark. 800 m circuit track – starts at the end of the carpark and goes around the mountain before heading to the top. 1.8 km circuit walk – starts at the end of the carpark and does a longer loop around the mountain (shown in green on the map below). 3.8 km circuit walk – starts at the carpark: walk down past the toilet block, along the road for a few metres, and turn left. Check the map below (shown in orange on the map below). The mountain is also known as Great Sugar Loaf. It was named by Captain Cook in 1770. The name comes from the sugar in Brazil that was formed into conical shapes for export called "sugar loaves". The mountain was an important location for the Awabakal people. There’s a creation story about the mountain, ceremonies have taken place here and elders would teach younger people about places and clans that were nearby using the panoramic view. The mountain is better known for the snow it received in 1965 – about 10 cm. Hundreds of people flocked there and children made snowmen. Check out these other attractions in Lake Macquarie. Follow George Booth Dr for about 1.8 km. Turn left onto Mount Sugarloaf Rd and drive to the end. Wondering what to do on the Central Coast? Copyright © 2016-2019 by Christine Lemieux, iCentralCoast. All rights reserved. 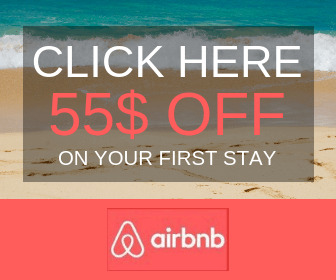 * As an Amazon Associate I earn from qualifying purchases.